In honor of the 2014 TCM Classic Film Festival screening of Harold Lloyd’s 1923 feature comedy Why Worry? at the Egyptian Theater on Friday, April 11 at 7:15 pm, here are a couple of quick views from the conclusion of the film. Lloyd’s granddaughter Suzanne will be in attendance, while composer Carl Davis will be on hand to conduct his original orchestral score for the film. 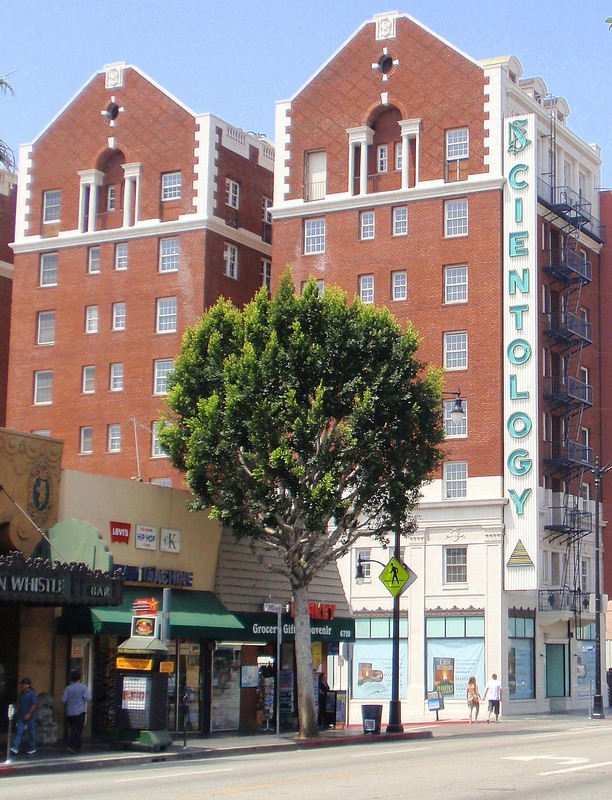 Looking west down Hollywood Blvd. as actor John Aasen directs traffic at the intersection of Cahuenga. The extant Toberman Hall (1907 – yellow oval) and Hotel Christie (red box, and below) appear at back. Why Worry? concludes with Harold sprinting down Hollywood Boulevard to share with his friend, a gentle giant played by John Aasen, the news that Harold’s character has just become a father (see top). They celebrate in the intersection of Cahuenga Boulevard, the same spot where Charlie Chaplin and Marie Dressler filmed Tillie’s Punctured Romance (1914), and near where Mary Pickford shot a 1918 Liberty Bond promotional film (see below). You can read more about Chaplin and Pickford filming at this Hollywood landmark at these posts HERE and HERE. Click to enlarge – the same corner appearing in Tillie’s Punctured Romance and in Mary Pickford 100% American. 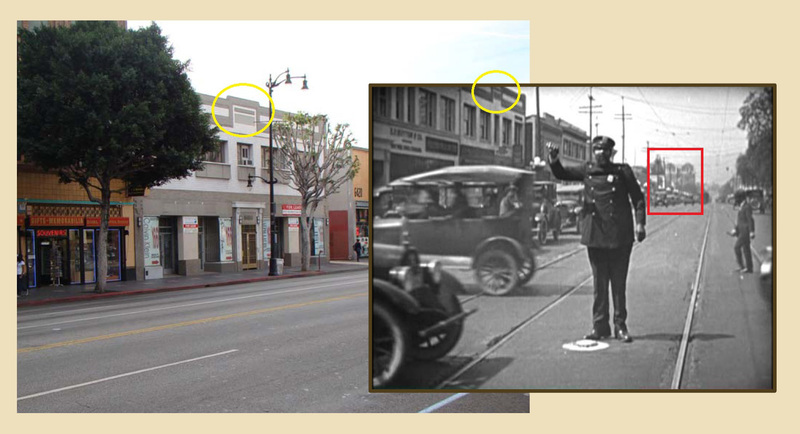 With a bit of movie editing magic, while the giant stands at Cahuenga looking east as Harold runs towards him, the matching shot of Harold running west towards the giant was staged at Hollywood Boulevard beyond Sycamore Avenue, many blocks west from where the giant was standing (see below). You can read more about this setting, and how it appears in Buster Keaton’s Sherlock Jr. (1924) at this post HERE. Looking east down Hollywood Blvd. past the former Richfield gas station on the corner of Sycamore, as appearing in Lloyd’s Girl Shy (1924) left, and in Why Worry? (right). Harold is supposedly running towards the giant who was actually filmed several blocks behind where Harold is running. This entry was posted in Harold Lloyd, Hollywood Tour and tagged Harold Lloyd, Hollywood, Hollywood Tour, Lloyd Studio, Silent Comedians, Silent Comedies, Silent Movie Locations, Silent Movies, TCM, TCM Festival, then and now, Tillie's Punctured Romance, Why Worry?. Bookmark the permalink. Someday, when I visit L.A. for the first time, I will come armed with an arsenal of your books. Always fascinating reading, sir! Hi John. In Why Worry there is one more close-up shot of John Aasen’s face and the buildings in the background appear to be different than those seen at Hollywood and Cahuenga in the long shot. One of the buildings in the close-up, for example, has a dark arrow-like sign that extends from the top of the facade. I just saw WW last night on TCM and haven’t gone looking, but was wondering if you had located those buildings, too? Or maybe I am just confused about what I was looking at. I checked that on DVD – there is a very brief close-up shot of Aasen cut into the scene. The background of that shot does not appear to match the corner of Hollywood and Cahuenga, but is otherwise generic looking. Perhaps after pre-viewing the movie they realized they wanted a close-up shot of John, and took him to some nearby street to capture the shot. In HOT WATER they took a traffic cop, filmed primarily in Santa Monica, yet got a reaction close-up shot of him on Bunker Hill (see pages 36 lr and 164 of Silent Visions).